It might not be the most obvious fleet choice, but with the tide turning away from diesel, a high-performance gasoline-powered SUV could be more in demand than you think, says John Challen. A relative latecomer to the SUV party, Alfa Romeo is wasting no time in catching up with fellow contenders in the premium segment. The Quadrifoglio sits at the top of the Stelvio tree, with its 2.9-litre V6 bi-turbo engine that offers a maximum power of 517hp at 6,500rpm and 600Nm between 2,500 and 5,000rpm. 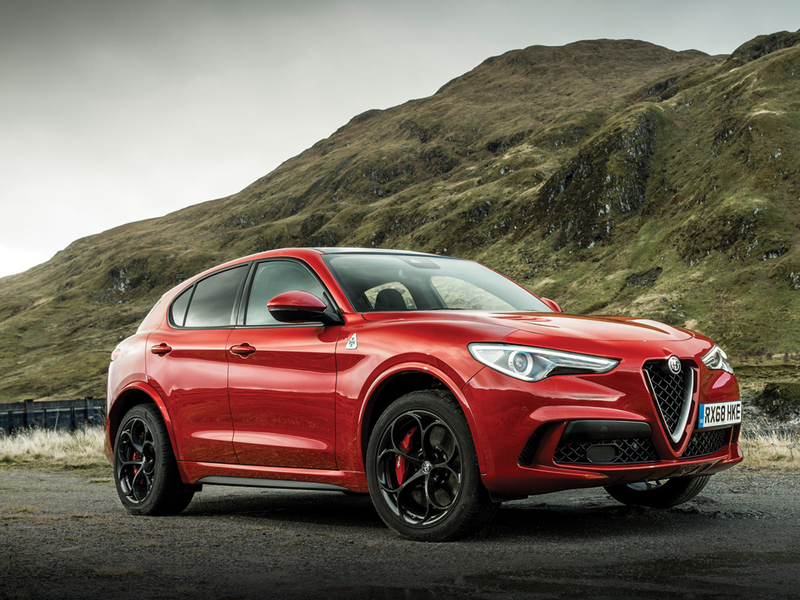 Certainly no slouch, the Stelvio Quadrifoglio has been dubbed ‘the fastest SUV around the Nürburgring’, having completed the legendary lap in 7 minutes 51.7 seconds. To help manage the weight distribution, the Italian car uses Alfa’s Q4 all-wheel-drive system to transfer 100% of the torque to the rear axle under normal conditions, before shifting up to 50% to the front when reaching the engine’s limit. Other clever technologies on the car include Chassis Domain Control, Active Torque Vectoring and Alfa’s DNA Pro with race mode. The performance is certainly impressive, but as important as the car’s figures are the creature comforts on the inside. Plenty of leather and alcantara can be found on the seats, which have been specifically shaped for more support when cornering. There is also a touch of carbon fibre on the console, dashboard trim, door handle inserts and steering wheel rim. Stelvio Quadrifoglio gets Apple CarPlay and Android Auto, both systems working with the Alfa Connect 3D NAV 8.8-inch screen, which is standard on the car. Developed jointly with Magneti Marelli, the infotainment system offers ‘a sophisticated series of features and functions, including a next-generation human-machine interface, controlled by a Rotary Pad’, according to the Italians. In addition, thanks to “optical bonding” technology, the user benefits from an excellent level of visualisation and readability on the display. Alfa Romeo has always dared to be different and it appears that some things never change. Introducing an SUV is nothing new, but bringing one to market with so much performance on offer is a brave move from the manufacturer.